Of my tried and tested tricks, my key has always been moisturizing. Call me crazy, even though I always had oily skin, in winter when my skin turns dry, I simply cannot stand it. Even after a wash, when my skin feels dry, I hate it and perhaps I am the only oily-combination skinned person on earth who moisturizes even in summer. In fact, I feel since my skin is sensitive and the weather gods can never makeup their mind, my skin acts differently everyday and to find products for the day is such a woe! My summer 2016 is slightly different. As I am about to turn... not telling you, Ha! my skin is turning combination with just an oily t-zone which means, I cannot stay away from moisturizers. Here are four of my current favorites. till eternity till I get a good-photo-day, so I decided to just to go with it. Pond's Silk Cream: This one feels really soft on my skin and spreads and absorbs in no time leaving no greasiness behind. Ages ago, I had a tiny pot and this time also, I received a tiny pot just to refresh my memory a bit. This one works for me, but I find a zit or two if I get heavy-handed or if I use regularly. So, if my skin demands, I use it alternate days and it works well. The Body Shop Drops of Youth Cream: You know how I am in love with the serum and when they came out with the cream, I was delighted. I have not used it that regularly yet to form an opinion, but so far, I am loving it. Give me another week for the review please. Last but not the least, Himalaya Herbals face Moisturizing Lotion for all skin types: I had reviewed one earlier, but seems like we need an update here. I don't use it regularly, but only less-oily-and-more-dry days, I would slap on some. So, there goes a quick and fun list. What do you think of this? Does your skin also act so funny? Do you change your skincare depending on the weather on the particular day? I am curious. 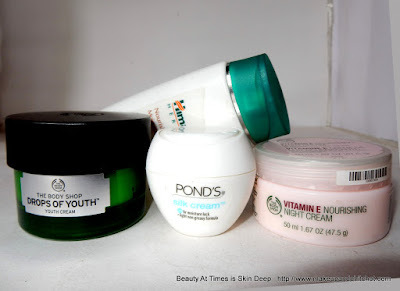 I too love ponds silk cream but I use it as night cream for my oily skin!!! I have never tried it as a night cream. I think I might want to give it a go that way. I've been meaning to try the Drops of Youth since forever but I still haven't gotten around to it. I love TBS vitamin E night cream buy I really want to try the Drops of Youth Cream,looks promising though.Really nice compilation dear.